We feature excerpts by Gandhi that lend insight into his values and personal practices. Rabindranath Tagore, Nobel Laureate in 1913, first called Gandhi a Mahatma or a Great Soul. He said: "With Gandhiji's call, India blossomed forth to new greatness, just as once before, in earlier times, when Buddha proclaimed the truth, of fellow feeling and compassion among all living creatures." He continued: "Gandhiji stopped at the threshold of huts of thousand of dispossessed, like one of their own. He spoke in their own language. Here was the living truth at last, not quotations from a book. For this, Mahatma -- the name given to him by the people of India -- is his real name." 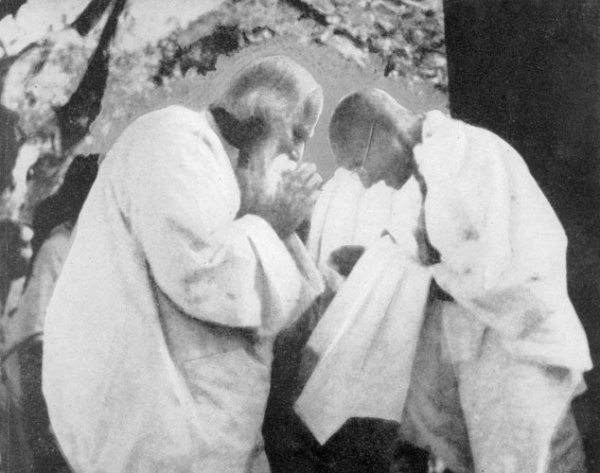 In return, Gandhi called Tagore "The Great Sentinel" or Gurudev. The poet and the karmayogi met for the first time on March 6, 1915 when Gandhi and the boys of his school visited Tagore's community in Santiniketan, where the poet had a school for children (which is now a university). As the following 1940 speech shows, the two of them were very close despite their different ways to approach freedom. The reverence of their mutual respect and love for each other is palpable in this brief interaction. "I know what love Gurudev has for me. I recollect the early days of the Ashram in 1915 when I had nowhere to lay my head. I have not come here as a stranger or a guest. Santiniketan has been more than a home to me. It was here that the members of my South African family found warm hospitality in 1914, pending my arrival from England, and I too found shelter here for nearly a month. The memories of those days crowd in upon me as I see you all here, assembled before me. It grieves me that I cannot prolong my stay here as I would have loved to. It is a question of duty. In a letter to a friend, the other day, I described my present trip to Santiniketan and Malikanda as a pilgrimage. Santiniketan has truly, this time, proved for me a ‘niketan’ of ‘shanti’—an abode of peace. I have come here leaving behind me all the cares and burdens of politics, simply to have Gurudev’s darshan and blessings. I have often claimed myself to be an accomplished beggar. But a more precious gift has never dropped into my beggar’s bowl than Gurudev’s blessings today. I know his blessings are with me always. But it has been my privilege today to receive the same from him in person, and that fills me with joy. Words are useless when the relation is one of love. (1) CWMG, Vol 77, p. 339-340, Speech at Santiniketan, Harijan, September 3, 1940, and Amrita Bazar Patrika, February 18, 1940. (2) The Mahatma and The Poet. Sabyasachi Bhattacharya,. The Director, National Book Trust, India Nehru Bhavan, 5 Institutional Area, Phase-II, Vasant Kunj, New Delhi, 1997. This week try to exercise your muscle of simplicity in the way you speak and write. Notice how great feelings of love could be communicated with few or no words at all.